The Fiamma F80S Roof Mounted Campervan and Motor home awning canopy is the latest Fiamma have to offer for roof mounted awning with its modern and compact look replacing the F65s awning canopy. Fiammas latest F80S Campervan and Motor home awning canopy has been designed with an aluminium casing providing extra strength whilst remaining lightweight and able to follow the contours of modern vehicles giving a neater, sleeker look that’s less obtrusive and more versatile. 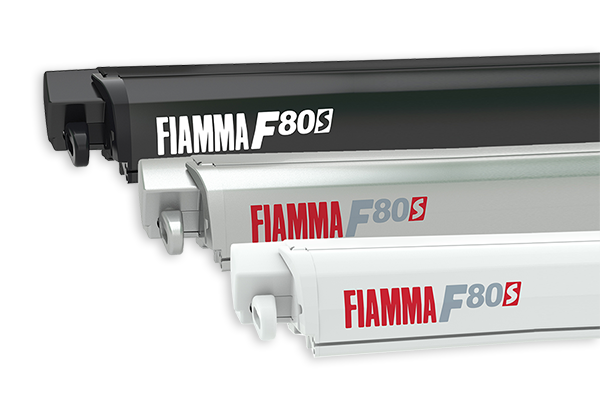 With a wide range of new features the Fiamma F80S Awning Canopy is supplied with a Triple Guide lead bar allowing multiple accessories to be fitted to the F80S Awning Canopy as well as duel LED predefined housing for the optional extra LED Strip Kit and the option of fitting a Motor Kit at a later date. The Fiamma F80S Roof Mounted Campervan and Motor home Awning Canopy is provided without brackets though can be easily bought by choosing the most suitable to your vehicle by making note of the make, model and year the vehicle was produced.